Published in February of 2015. In the time it took me to get around to reading his book, Harari has written two more. Sapiens, as all of you know who have read the book, is fantastic. It is also un-reviewable. Why? Because it is a book about everything. Sapiens is like one of the meals where an insanely skilled chef takes everything in the fridge and whips up the best meal you’ve ever tasted. But instead of a refrigerator, Harari is working with the entire supermarket. How many books can convince you that most of the things that you thought you knew about how the world works are wrong? That history, going back to pre-history, did not unfold as you were taught? That society hangs together on the force of structures that actually consist of only made up ideas? (Such as the nation, money, the market, religion, I could go on). 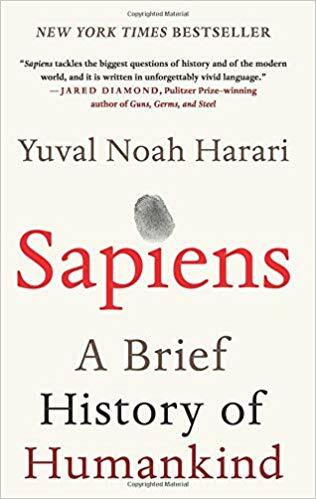 There is so much in Sapiens that any reader will find huge sections to love (I liked his writing on progress) and to hate (Harari definitely gets nationalism wrong – it did not go away). If you like big idea books, Sapiens is your book. Did you love Jared Diamond’s Guns, Germs, and Steel: The Fates of Human Societies? Then you will love Sapiens. And yes, the story of Cortes’ conquest of Mexico is in Sapiens – but so is everything else. This is absolutely the sort of book that I just love. And I loved reading Sapiens. So why did it take me so long to read a book that I should have read years ago? Not sure. I think that I read some mediocre reviews. But I might have been reading mediocre reviews of Harari’s later books. Why did I read Sapiens? Two words. Eddie Maloney. Dr. Maloney’s gentle campaign to persuade me to read Sapiens over the past few years finally wore me down. How do you pick your nonfiction books? First, the nonfiction book has to be available in the synched e-book/audiobook format of a Kindle/Audible digital book pair. This is a terrible vice. Probably worse than smoking, or watching The Kardashians. My Whispersync addiction means that I’m not reading the academic press books that I should be reading. (And that Eddie and I are hoping to publish with). Well, some academic press books – but not nearly enough. And lots of other great books I’m missing that are not in my privileged/lazy/ridiculous must-have format. Harari would have something to say about Whispersync, but maybe the technology was too new when Sapiens went to press. Second, I’ll read a nonfiction book if I’ve read a previous book by the same author. And I liked the book. I’m one of those readers who tends to read every book by an author that I like. We might all be those kinds of book readers. This is a problem, given the mediocre reviews I’ve read of Harari’s books after Sapiens. But I’ll ask you, are Harari’s other books worth reading? My third book reading forcing function are book reviews. Have you also noticed that there are not enough book reviews to read? The NYTimes book review is excellent. But no other newspaper seems to review enough books. I don’t know why I don’t read the NY Review of Books. Do you? Goodreads (owned by Amazon) is a site that I can’t figure out. It should be so good – but it isn’t. There does not seem to be a good website that aggregates all book reviews. Why is that? Fourth and finally, I read nonfiction books based on recommendations of friends, colleagues, and the members of our IHE community. If Barbara Fister or John Warner or Matt Reed or Eric Stoller recommend a nonfiction book – then the chances are good that I’ll check that book out. Scott McLeme is maybe the best book critic in the higher ed ecosystem, but his recommendations often fall out of the Amazon digital book industrial complex. If you tell me which nonfiction book you are reading, I am likely to want to read that book so we can book club.